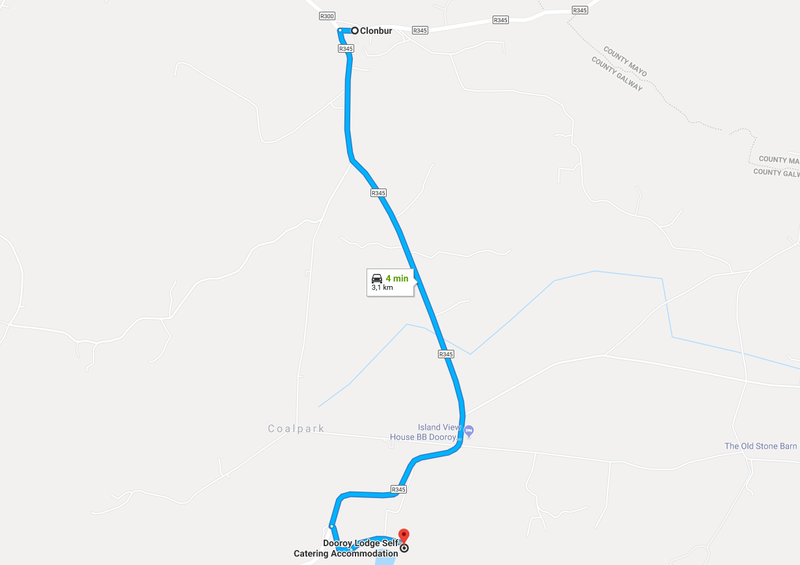 • Clonbur village – 3KM – our quaint village has a Centra Supermarket, 3 Pubs, 2 Restaurants, Gift Shop, Post office & RC Church. On arriving in Cong turn left at the Spar Shop & Fuel Station beside the river. Continue straight to Clonbur village, approx 5 kms. In Clonbur village, keep left after the Centra Supermarket, and continue until you view the lake. The lake will now be on you left. After about 0.5 km you will see a brown directional sign – Dooroy Lodge Self Catering, turn left here driving down towards the lake. Turn left again into “Dooroy Lodge” entrance with black gates.